All veterans have a story to tell. For too long, we have lived in a day and age where veterans tend to suppress their experiences – producing a culture of the “silent veteran.” Frontline Paper (formerly known as Combat Paper NJ) is a unique art project that offers artistic tools and professional instruction for all, providing a space to use art and writing to explore experiences, and ultimately share them publicly, all through papermaking. Our specialty is the transformative process of making handmade paper from military uniforms. Through public workshops, this handmade paper creates a platform for veterans and non-veterans to come together and share stories, providing a “new language,” and much needed discourse between veterans and society. In casual drop-in sessions, on college campuses, in community centers, at pop-up street corner workshops, and at VA and military hospitals, Frontline Paper artists teach the art of papermaking and printmaking to veterans of all service eras. Uniforms can hold dirt, blood, sweat, and memories. Each workshop session begins with the participants sharing their stories while cutting into the uniform. They deconstruct the trace object as they deconstruct the memories associated with the uniform. The cut pieces of uniform are beaten into a pulp using specially designed papermaking equipment, creating a slurry of fibers and water. Sheets of paper are then pulled from the pulp and dried to create handmade paper. In this process the fibers and memories are reconstructed, or reclaimed into something different - paper. Dried sheets of paper become the platform for veterans to communicate their stories. Through instructional periods, veterans integrate drawing, printmaking, and/or written words into their paper using various techniques. Whether the blank paper, or a created image on the surface, each work of art tells a story through the new language of papermaking. Community-based events, and exhibitions are important opportunities for veterans to talk about their military service, and for society to hear stories from the veterans themselves, the people. The practice of community-based art, storytelling and making, engages society, gives everyone a voice, and exposes the true complexity of the veteran experience. 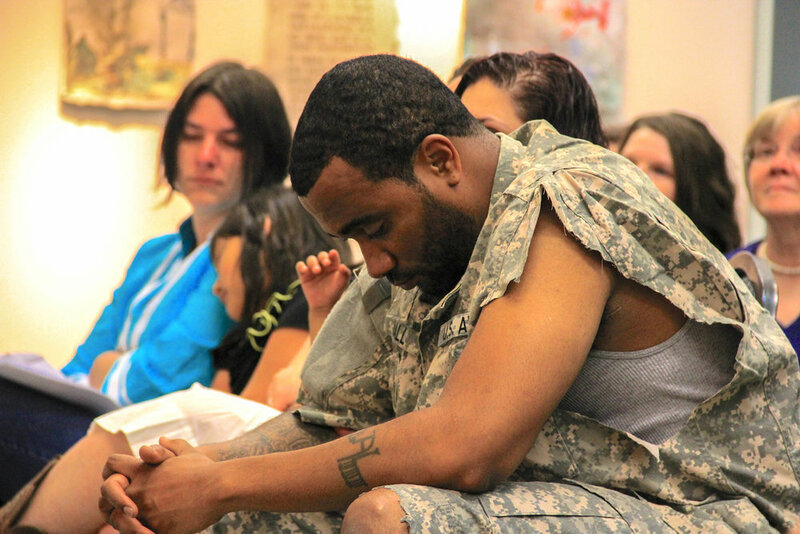 This sparks a dialogue of the raw realities of what it means to serve in the military, and live through the aftermath. These opportunities help the public better understand the complex veteran narrative, and raise awareness among witnesses that the current bridge built between veterans and society needs repairing. For more information on the program, or to book a workshop at your community center, VA Center, VA Hospital, arts institution, university, or college, please contact Program Director and Co-Founder of Frontline Paper, Dave Keefe, by clicking the Frontline Paper Request Form button below. We work hard to ensure our Frontline Paper workshops are always FREE for Veterans. Our Veteran-Artist Instructors are here in the studios every Sunday from 12-4pm during our open, drop-in hours. No RSVP or fee required. Stop by to check out the studios, learn about the program, and get hands-on with papermaking from military uniforms. We can help you create your own unique batches of paper pulp from your military uniforms, or you can work from our community paper pulp, comprised of donated military uniforms from different branches of the military. We respectfully request Sunday workshops stay focused on the Veteran community. If you are not a Veteran, but are interested in the program, please contact us for a tour on a different day. We host free public papermaking demonstrations at Art Festivals across the state and plan to expand the workshop into a public class offering in the near future. Interested in donating your military uniforms? Frontline Arts' accepts donated military uniforms. If you or someone you know has military uniforms they are not sure what to do with, please consider donating them to Frontline Arts! Follow Frontline Paper on Facebook! Frontline Paper, formerly known as Combat Paper NJ, is supported by a charitable contribution from Janssen Pharmaceuticals, Inc.
Frontline Paper is also supported, in part, by Church & Dwight Co., Inc.